How to upload vector files like Shape, MapInfo, GML, GeoJSON etc. Click the "Add files" or drag files into the dialogue. You can drag multiple file sets in at once. Set EPSG code. For example, 4326 for wgs84. If you upload other that Shape is a good idea to set the geometry type of the data. Otherwise there is a risk that the geometry is recorded as being mixed. If the maps contains texts beyond ASCII, encoding must be set correctly so letters is displayed correctly. If the maps contains errors, so some features can't be imported, then skip these. If there is already a layer with the file name, it can be overwritten. If Delete / append is checked, an existing layer will not be overwriting. But it'll be emptied and the file is imported into the empty layer. Use this to avoid dropping depending database views. 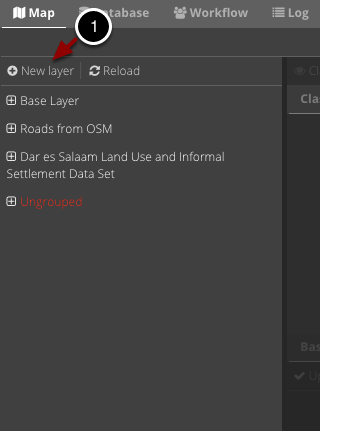 After upload, the new maps sets are available in Map tab where it has been given a standard styling and in the Database tab where you can set additional properties of the maps set. Click "Add raster" or drag files into the dialogue. You can drag multiple file sets in at once.